The Multi-Mode Microplate Reader is a ubiquitous and essential laboratory tool for qualitative and quantitative analysis. Providing multiple detection modes allows for the use of a wide variety of quantitative assays from colorimetric ELISAs to small molecule drug screening assays using proximity-based technologies that require no washing steps, such as time-resolved fluorescence resonance energy transfer (TR-FRET). Typically, these assays require high sensitivity and in the case of TR-FRET screening assays, rapid switching of detection wavelengths to generate signals. The most optimal optical components for providing this need for speed and sensitivity are spectral bandpass filters. The main limitations to the use of spectral bandpass filters are that one typically requires a unique set of filters optimized for each fluorophore used and one cannot obtain spectral scans. 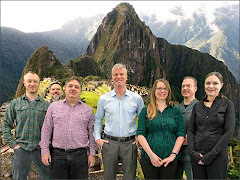 Monochromators using diffraction gratings circumvent these issues providing the ultimate flexibility in wavelength selection and the ability to obtain spectra. The main drawback in using monochromators is the light transmission through the optical system is much less than for spectral bandpass filters and thus the sensitivity is less. Laboratories usually must make a choice between a filter-based or monochromator-based multimode reader. 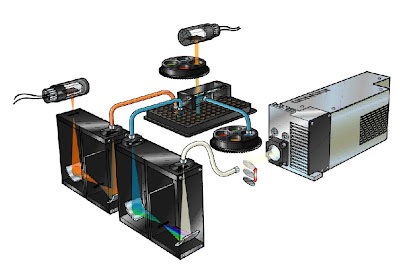 If speed and/or sensitivity are the dominant need, then a filter-based system is chosen; if flexibility and spectral scanning is required, then a monochromator-based system is acquired. If all attributes are required, then typically the laboratory must buy both. BioTek’s Synergy™ 4 with Hybrid Technology™ circumvents these issues by provided both a monochromator-based optical path for fluorescence measurements and spectral filter-based modules for assays requiring speed and sensitivity. Below is a figure depicting Synergy 4’s optical paths. Figure 1: Hybrid Technology utilizing both monochromator- and spectral filter-based optical paths. 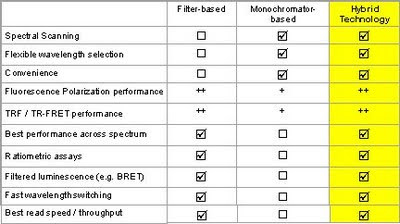 The table below demonstrates the main attributes of filter- and monochrmator-based readers and how Hybrid Technology encompasses all. Does your laboratory use filter- or monochromator-based microplate readers? Do you see the benefit of Hybrid Technology?